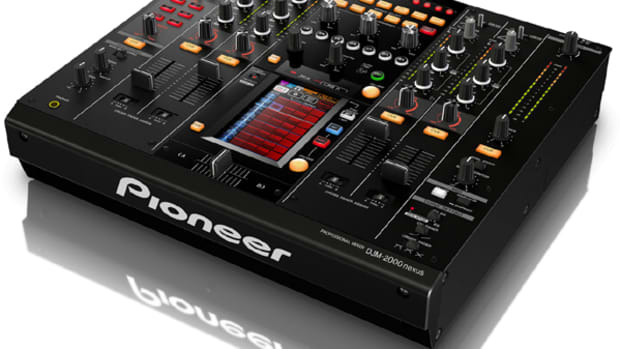 Pioneer DJ division has just announced their newest DJ mixer in the professional "DJM" line dubbed the Pioneer DJM-750. This new four-channel mixer has a built in 4-in/4-out USB soundcard and a host of effects options such as the brand new Boost Color FX, the Sound Color FX, and the Beat FX which can be combined to create over 100 types of effects for even more creative options. for reference. 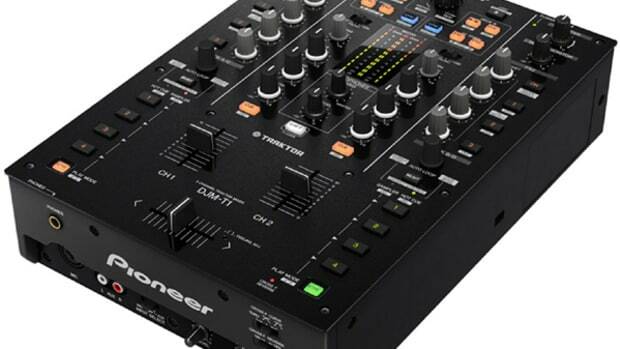 The DJM-750 does not have the same Traktor Scratch Certification as the DJM-850, so its likely (to me anyway) that Traktor will start focusing on their own mixer lineup going forward (Traktor Kontrol Z4?). 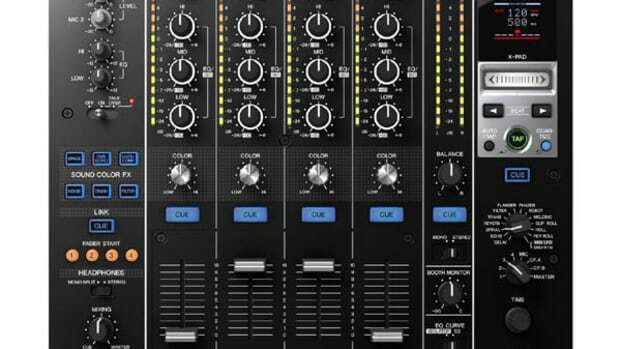 The DJM-750 should still be capable of DVS timecode playback on other DJ software and the mixer also sends all MIDI data to the computer via USB. The DJM-750 also only has one Sound Color FX knob while the DJM-850 has a knob for each individual channel. 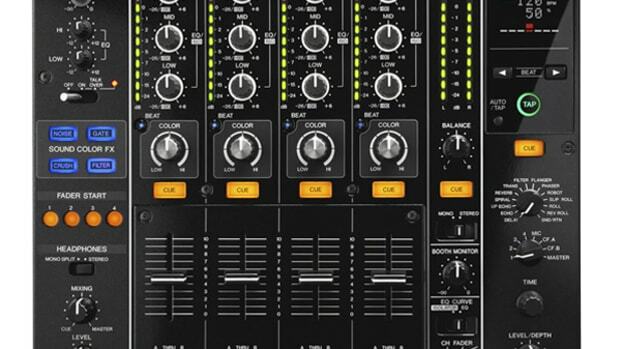 The DJM-750 does have the new Boost Color FX which enables users to change the parameter of an effect with the varying rotation speed of the integrated controller knob. The degree of the selected effect is intensified (i.e. increase cut rate) the faster the knob is turned. 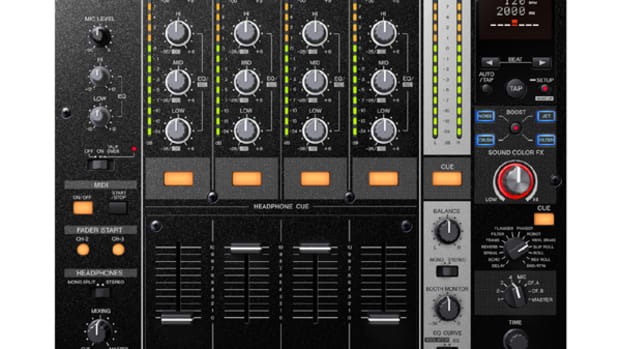 The DJM-750 also has all of the Beat Effects found on the 850 and the Sound Color FX can be combined to create over 100 different effects for the DJ to remix with. The Pioneer DJM-750 will be available in June in black (DJM-750-K) or silver (DJM-750-S) for the retail price of about $1200. Check out the press release below and stay tuned as we&apos;ll definitely get one in the DJbooth.net lab for the full video and written review treatment. The new Pioneer DJM-750 Four-channel Professional DJ Mixer is finally in the DJbooth.net Lab for a full out video and written review. 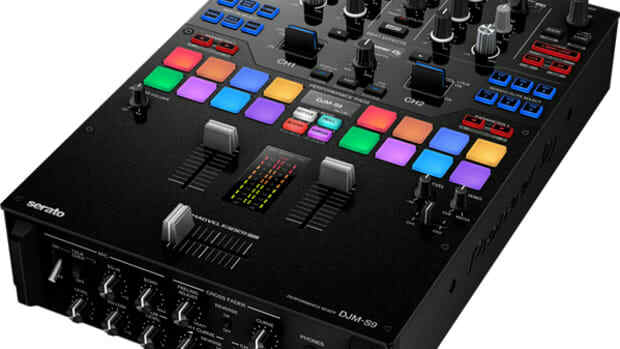 This new four-channel mixer has a built in 4-in/4-out USB soundcard for DVS timecode use and a host of effects options such as the brand new Boost Color FX, the Sound Color FX, and the Beat FX which can be combined to create over 100 types of effects for even more creative options than ever before. The review of the DJM-750 should be completed shortly, but check out the unboxing and first impressions video in the meantime to see what comes in the box. 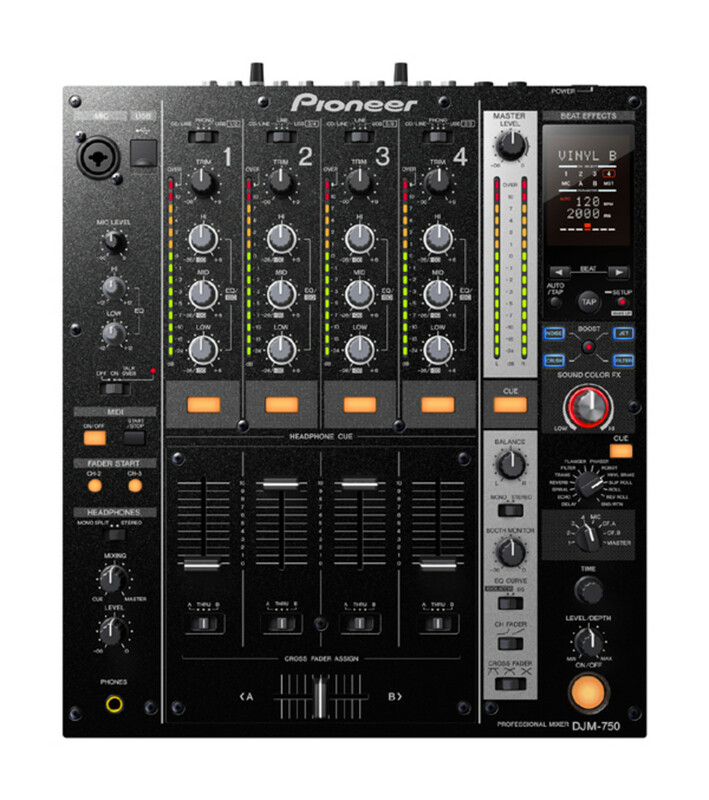 Pioneer has been slowly phasing out it's aging Club mixer lineup in favor of the new "Nexus" type models which have lots more features and provide a general update for their previous entries. 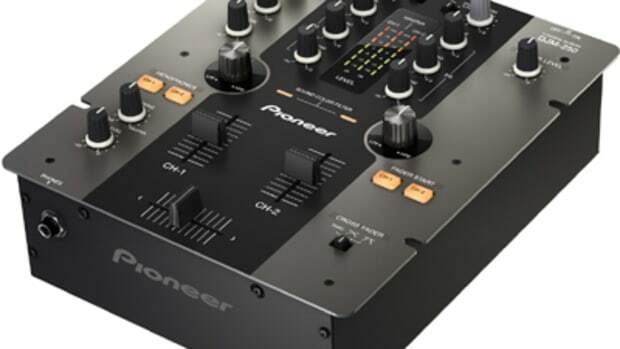 The Pioneer DJM-800 has now has a new successor and will soon be replaced by the new Pioneer DJM-850 performance DJ mixer which was just announced yesterday. The new DJM-850 has much more functionality when used in conjunction with DJ software with its built-in USB sound card, the new BEAT COLOR FX function, and lots of other features that will get club DJ's in a frenzy. Press Release, details, and VIDEO inside. Pioneer has just announced the all-new and super-powerful DJM-2000nexus professional DJ Mixer. This new mixer makes the perfect companion to the CDJ-2000nexus media players and can do things no other mixer can do. The DJM-2000nexus has a cool new 5.8-inch full-color multi-touch screen to control effects, a built-in Live sampler for recording and playback, and a cool Pro DJ-Link LAN cable section which allows users to sync and connect up to four CDJ's and two laptops. Check out the video, press release, and my full breakdown inside. Pioneer has just announced the DJM-250, a new two-channel entry-level mixer with lots of inputs and outputs and a filter effects knob for each channel. This mixer will be available in Black (December 2011) and in White (Janurary 2012) shortly. They promise to deliver the same professional sound quality as their higher-priced mixers but for a great price that most DJ's can afford. There are 8 Inputs and XLR Balanced Outputs for those who want the best sound possible. More details, links, video, and press release inside.